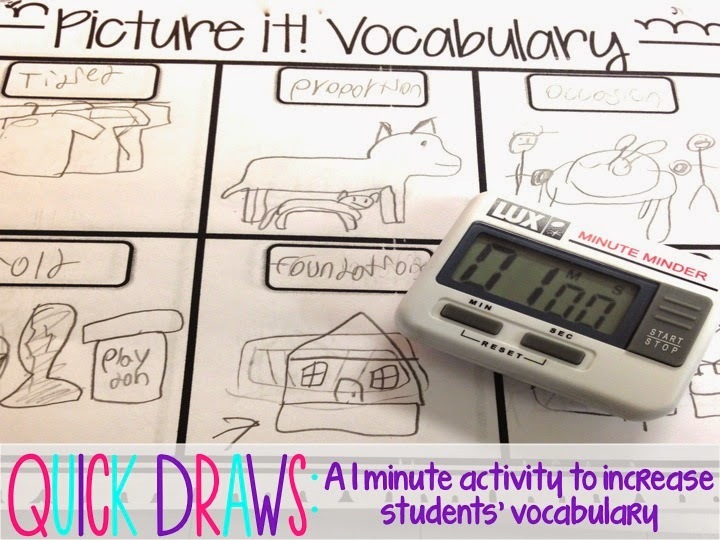 Quick Draws: A 1 minute vocabulary activity: Freebie! Sometimes you plan and plan a big elaborate lesson and sometimes, the best lessons come to you about 10 minutes before class. This activity is one of those. Tuesdays are when we tackle most of our vocabulary work. I had several things planned and while the kids were working on the warm up, a neat little "game" popped into my head and I can't wait to share it with y'all! If you teaching Reading Street, you might have noticed the vocabulary resources online. If you aren't a reading street teacher, I'm sure you have vocabulary cards that you use as well. I've started using these to show the kids different examples of the words, and today I decided I wanted them to come up with their own example for each word. The problem was we were pressed for time and I had a million and one things to cram in. I needed an activity that wouldn't take up a ton of time, yet provide enough practice to be beneficial. So I decided to create Quick Draws! Step 1: Have students write each vocabulary word in the smaller boxes. I've included a template with six boxes and one with eight depending on the number of words you have. Step 2: Set the timer for 20 sec. This is called "Brainstorm Time" During this 20 second period, students sit with their eyes closed and brainstorm how they want to illustrate the word. There is no talking and no writing/drawing during this time...just thinking! Step 3: At the end of the Brainstorm Time, set the timer for 1 minute. Students will have 1 minute to draw their illustration to show the vocabulary word. Now isn't the time for details! It's just a quick sketch or doodle with just enough detail to figure out the meaning of the illustration as it relates to the word. Step 4: Repeat steps 1-3 for each of the vocabulary words. My kids did so well with this little activity! We did a vocabulary assessment afterwards and the grades were really good! I'm going to make this a staple in my weekly vocabulary lessons. You can grab your free copy of the template here! I love love love this idea! I think it could totally work with my firsties too! I was looking for a way to step up my vocabulary game and this is perfect! I use Reading Street, so I totally get what you are referring regarding voc instruction. I'm going to be using "Quick Draws" from now on! LOVE!!! !